WASHINGTON — With nine of the 12 available playoff spots already locked down, along with seven of the eight division titles, there are very few important NFL games being played this weekend. In fact, the only game that will affect both a playoff spot and a potential division champion is Carolina vs. Atlanta, with the Panthers having already made the playoffs. But just because there aren’t many meaningful games doesn’t mean there can’t be some fun ones. In that vein, it’s worth taking a look back and appreciating one of the craziest games in modern NFL history, the aftermath of which’s far-reaching effects are still being felt. You may remember Tom Tupa (he finished his career with one season in Washington in 2004). 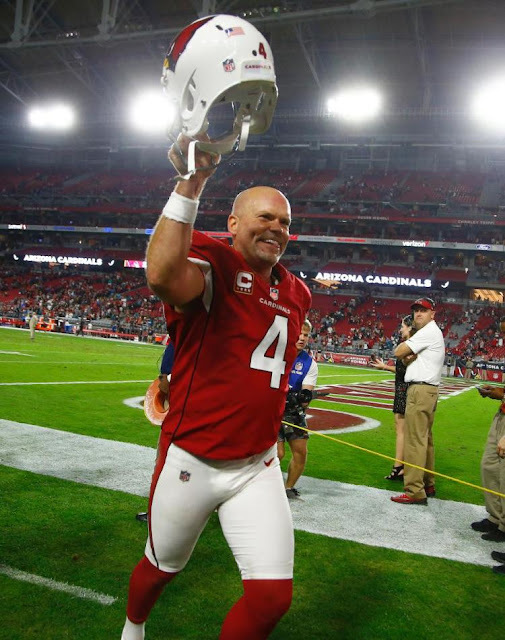 A punter with an alliterative name that rolled off the tongue, he was also a college quarterback his senior season at Ohio State, and even a starting quarterback in the NFL, going 4-9 over 13 starts with the Cardinals between 1989-91. Perhaps that’s why when he was the Cleveland Browns’ punter and Bill Belichick was head coach, he was used to score the first two-point conversion in NFL history. Tupa’s fake from the holder position was actually used three times in that 1994 season, earning the nickname Two Point Tupa. Fast-forward to 1999. Tupa is now playing for the New York Jets, under Bill Parcells, with Belichick as his offensive coordinator. 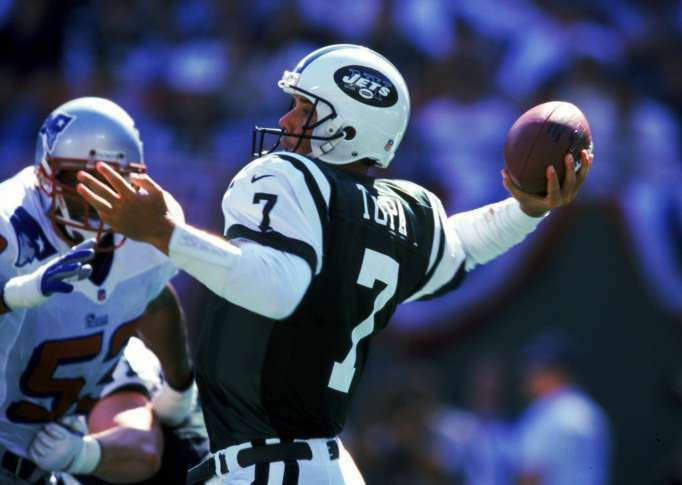 In the opening quarter of the first game of the season against the New England Patriots, franchise quarterback Vinny Testaverde goes down in a heap, his Achilles ruptured. Parcells had a decision to make. An obscure NFL rule did not allow him to activate his bench quarterback, Rick Mirer, until the fourth quarter, without losing his emergency quarterback (and punter), Tupa. Parcells rolled the dice on putting Tupa under center — the gamble worked. Tupa wasn’t perfect, taking a number of sacks, including one which led to a fumble and a New England touchdown. But he was otherwise pretty spectacular. Tupa entered the fourth quarter 6-for-11 for 165 yards and two touchdowns. He came in with his team down 10-7, but Parcells pulled him in favor of Mirer for the fourth quarter, with the Jets within five points. The Jets took the lead with a pick-six with under 10 minutes to play, but Mirer threw the game away — literally. He completed just four of his 11 passes, gaining just 28 yards and throwing a pair of interceptions, including the one that led to the game-winning field goal by none other than Adam Vinatieri. The Jets missed the playoffs by a single game, with the opener against the Patriots a glaring missed opportunity. Had they made it, Parcells may never have retired, as he did at the end of the ’99 season, opening the door for his assistant, Belichick, to become the next head coach of the Jets. But the Patriots fired their head coach — Pete Carroll — as well. That led to Belichick joining the Patriots and, after a successful stint at USC, Carroll to the Seattle Seahawks. The rest is not just history, but the dominant history of the league for nearly two decades, with New England drafting Tom Brady the next summer and winning five Super Bowls during his tenure. The fourth win came over the defending champion Seahawks, coached by Carroll, on the final play. What might the last 18 years of the NFL have looked like if Parcells had let Tupa finish that game? We’ll never know. But it goes to show how even the most simple, insignificant-seeming choices can have ripple effects still felt across the league years later. Who knows — maybe something wild will happen this Sunday, the true impact of which won’t be felt for years to come. If we’re lucky enough to get anything like a Tom Tupa Game, hopefully whoever our unlikely hero is gets a chance to finish the job. "No chance," Gundy told ESPN.com. "I don't care what people think. They can go fly a kite for all I care. Nah, most people aren't going to be strong enough in their own skin to say there's a guy at Division II wherever that's the best coach for a major Power 5 conference school that had been in the top five in offense year after year after year." 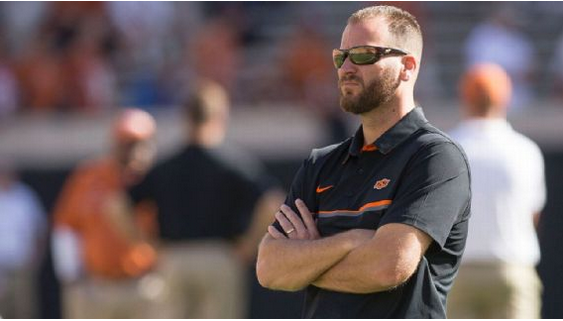 Gundy's pursuit and hiring of Mike Yurcich in 2013 to coordinate Oklahoma State's offense should at least make other coaches think before they target big-name assistants in the coming weeks. Oklahoma State leads the nation in passing and ranks third in scoring and second in total offense under Yurcich, a 2016 Broyles Award finalist. Todd Monken had left for the Southern Miss head-coaching job after two record-setting seasons with Oklahoma State. Monken followed Dana Holgorsen, who spent the 2010 season as the Pokes' OC before taking the West Virginia job. Since becoming Oklahoma State's coach, Gundy had only one offensive coordinator last longer than two years -- Larry Fedora logged three seasons before becoming head coach at Southern Miss. Gundy had numbers but no video, and tracking down the person who handled Shippensburg's film wasn't easy. "He was a fireman and teaching class," Gundy recalled. Oklahoma State eventually got three games sent its way as part of a film exchange, and Gundy liked what he saw. "You called the office and nobody answered," Gundy said. "It essentially was recordings, and I kept trying. Finally somebody answered, I don't know who it was, maybe somebody who worked there and walked by and grabbed the phone, and they said, 'He's gone recruiting,' or something. And I said, 'Well, how do I run him down?'" "Mike came in and Mike was like the movie 'Hoosiers,'" Gundy said. "He was the small school that made it to the state finals and had a chance to win. We've never talked about this, but I think he felt the pressure of being 'Hickory,' in that, 'I'm a Division II guy, and I went from making $50,000 a year to $400,000 a year, and I'm trying to do it for all the little guys who never got this shot.'" Yurcich occasionally tells Oklahoma State's players about his unique path to becoming their coach, reinforcing the message: Take nothing for granted. "Let me build a scenario for you," Gundy said. "It's the AD that hires everybody's favorite as the next head coach, because then, if the guy doesn't make it, he can say, 'Well, everybody wanted him. He was the logical choice, right?' You're not going to see very many coaches that have a gut feeling on a guy and hire a guy at Shippensburg, and have the fans or the administration patronizing you because you hired some guy that everybody thought you lost your mind. Former Parkston High School standout Riley Reiff, who in his first season in Minnesota has helped the Vikings to a 12-3 record and the NFC North Division title, headlines a group of five Mitchell-area winners selected by the South Dakota Sportswriters Association. 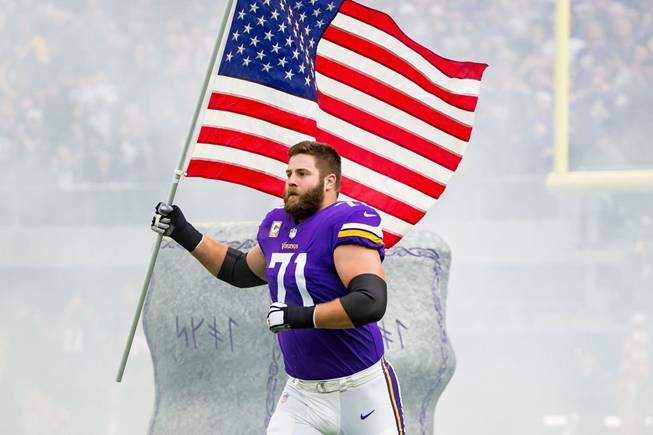 Reiff was selected as the sports Celebrity of the Year for South Dakota by the SDSWA, who have annually presented honors since 1954. Categories include athlete, coach and team in prep and collegiate categories, and "independent" team and athletes. After five seasons playing for the Detroit Lions, the pride of Parkston moved closer to home and signed with the Minnesota Vikings on March 9. 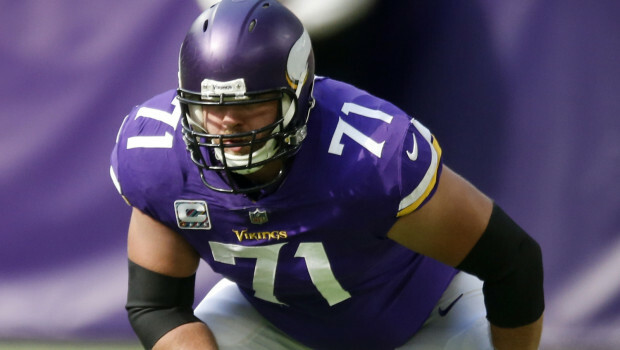 Reiff, 29, inked a five-year deal and moved back to the left tackle position for the Vikings, where he played the first four years of his career. 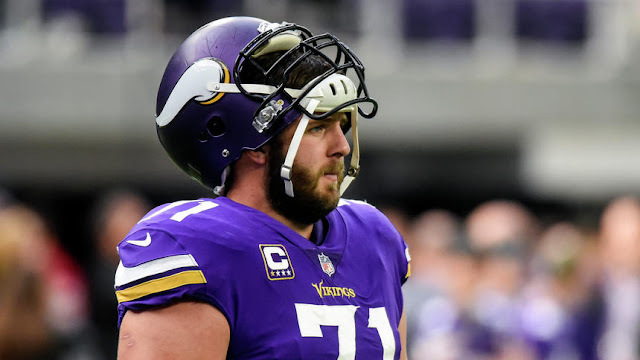 Reiff's signing with the Vikings ironically occurred in the same week Mount Vernon native and longtime local favorite Chad Greenway retired after 11 seasons with Minnesota. The Washington Redskins may not be playoff-bound, but two of their star players have earned trips to the Pro Bowl. The NFL announced Tuesday that left tackle Trent Williams and outside linebacker Ryan Kerrigan were named starters for the NFC team for the annual all-star showcase in Orlando, while guard Brandon Scherff was named as a reserve. Cornerback Josh Norman and linebacker Zach Brown are alternates. Last season, Williams, Kerrigan and Scherff were selected along with tight end Jordan Reed. It was the team’s highest total since five Redskins were selected in 2015. Washington has had at least one Pro Bowl player on its roster during the past 24 seasons. This marks the sixth Pro Bowl nod for Williams, who has earned the recognition every year since 2012. Williams is tied with Len Hauss and Chris Samuels for the fifth-most total selections in team history and is the seventh player in franchise history to earn at least six career Pro Bowl honors. For much of the season, the 29-year-old offensive lineman has been hampered by a knee injury that will require surgery. Williams was inactive for the Redskins’ 20-15 win over the Arizona Cardinals on Sunday — the fourth game he’s missed this season. After the win, however, Gruden said he wasn’t yet ready to place his starting left tackle on injured reserve. Even so, with only two games remaining — and a coveted Pro Bowl selection now secured — the organization could decide to finally place Williams on injured reserve so he can undergo surgery sooner than later. But the veteran offensive lineman has maintained all along that his goal is to finish out the season with his teammates. Although the defense (ranked 20th overall) has been inconsistent during the Redskins’ 6-8 season, Kerrigan remains a steady force. The linebacker, who was selected for the second straight year and third time is his career, leads the team with nine sacks. Kerrigan is the first Redskins linebacker to earn back-to-back Pro Bowl honors since London Fletcher (2009-12). 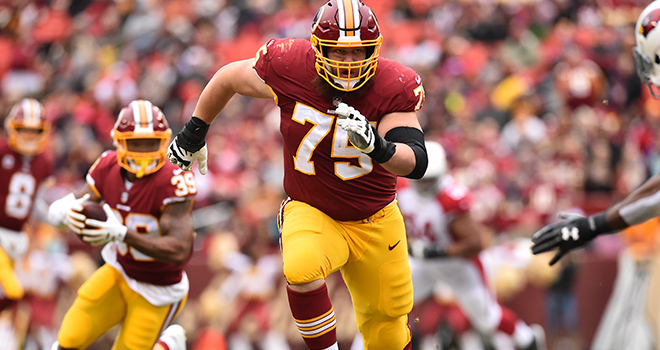 Scherff, the fifth overall pick in 2015, is the first Redskins’ interior lineman to earn multiple Pro Bowl selections since Hall of Fame guard Russ Grimm’s streak of four consecutive Pro Bowl honors (1983-86). Brown, the Redskins’ leading tackler (127), was named to the Pro Bowl last season after having a career year for the Buffalo Bills, finishing with 149 tackles (second most in the NFL), four sacks, four passes defensed and two fumbles forced. Though his numbers are down from a year ago, Brown (2½ sacks, two passes defensed) has played through Achilles’ tendon, toe, ankle and hip injuries in 13 games with the Redskins. The speedy linebacker missed his first game of the season Sunday. Norman was an alternate last year, as well. His only Pro Bowl selection came in 2015. 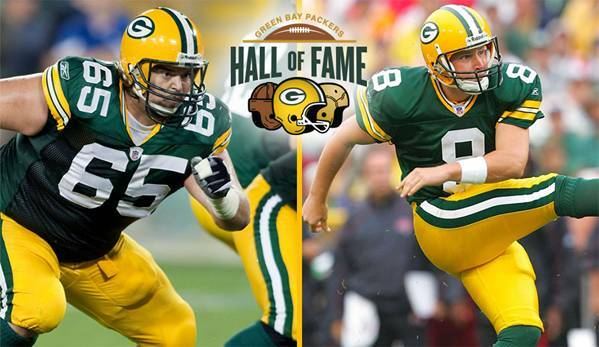 The Green Bay Packers Hall of Fame Inc. announced today that it will induct former Packers players Ryan Longwell and Mark Tauscher at the 48th Hall of Fame Induction Banquet, to be held Saturday, July 21, 2018, in the Lambeau Field Atrium. Placekicker Ryan Longwell entered the NFL in 1997 as a free agent, first signing with the San Francisco 49ers and coming to Green Bay off waivers later that year. Longwell’s 1,054 career points during his nine seasons (1997-2005) with the Packers stood as the team’s all-time scoring mark until 2015. He connected on 226 field goals and 376 extra points during his Packers career, leading the club in scoring in nine consecutive seasons. His 964 points from 1997-2004 were the most in the NFL over that span, and he holds Packers records for most consecutive games scoring, with 144 games from 1997-2005, and most consecutive PATs made, with 156 (2001-05). Following his tenure with the Packers, he spent time with the Vikings and Seahawks before choosing to retire with the Packers in 2013, at which time he ranked No. 13 on the NFL’s all-time scoring list, with 1,687 career points. Offensive tackle Mark Tauscher, selected in the seventh round of the 2000 NFL Draft, played in 134 games with 132 starts during his 11-year Packers career (2000-10). A Wisconsin native and University of Wisconsin alumnus, Tauscher made an immediate impact in his rookie year, taking over the right tackle position in Week 2. He started each game the rest of the season and was named to the Football News all-rookie team. Tauscher formed a longtime, reliable tackle tandem with fellow 2000 draftee and now-Packers Hall of Famer Chad Clifton, setting the standard for a consistent offensive line. Among Tauscher’s most significant contributions were helping pave the way for club records in rushing (2,558 yards) and average per carry (5.0) in 2003, and a franchise record for fewest sacks allowed (14) in 2004. Information about tickets for the banquet, which begins with a cash bar at 4:30 p.m., with dinner and program to follow at 7:00 p.m., is still being finalized and will be released in the near future at www.packershalloffame.com. The Green Bay Packers Hall of Fame Inc. Golf Classic is set for Monday, July 9, 2018, at The Bull in Sheboygan Falls, Wis. Please contact Holly Borga at 920/965-6986 or at hollyb@packershalloffame.com for more information. The Green Bay Packers Hall of Fame Inc. is a nonprofit corporation independent of the Green Bay Packers that guides the Hall as a historic national sports venue and educational resource to the Green Bay community and the state of Wisconsin. The Hall raises funds through its annual induction banquet, Golf Classic and other events to preserve the history of the Green Bay Packers and expand its archives. Historic memorabilia donated by individuals to the Hall may qualify as tax-deductible gifts. Originally established in 1967 as a temporary display in the concourse of the Brown County Veterans Memorial Arena, the Packers Hall of Fame moved into its own facility in 1976 near Lambeau Field. In 2003, it was relocated to the lower level of the Lambeau Field Atrium, and it was closed in November 2013 for renovations. The Packers Hall of Fame reopened in August of 2015, and is now located on the main floor of the Atrium across from 1919 Kitchen & Tap. Groups interested in booking tours and those seeking additional information may visit the Hall online at packers.com/lambeau-field/hall-of-fame/visit.html. 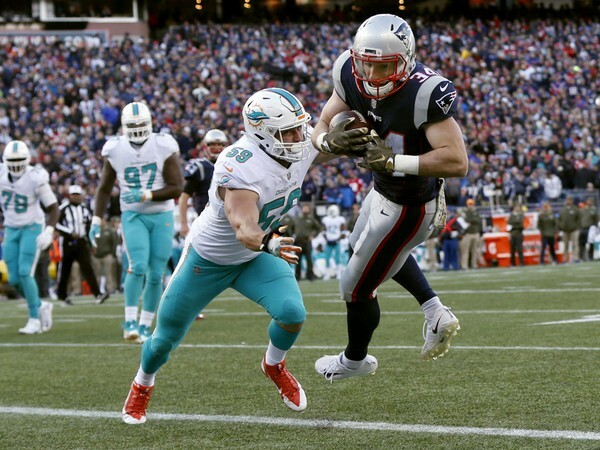 Rex Burkhead gathered his seventh TD of the season on Monday night in Miami. 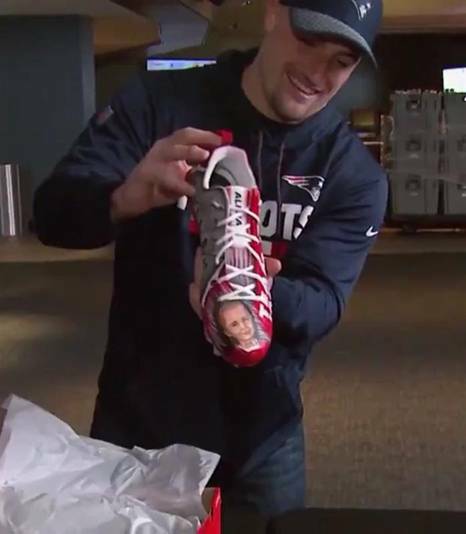 Rex Burkhead and Rob Gronkowski have, at minimum, one thing in common. Through Week 14 of the 2017 season, they share the New England Patriots’ lead in total touchdowns. Gronkowski’s been there many spikes before, seeing how the four-time All-Pro set the franchise record in October and became the fastest tight end to amass 70 TD grabs in September. Burkhead, though, really hasn’t been since his days at Nebraska. The 27-year-old running back reached the end zone four times over the course of his 42-game tenure with the Cincinnati Bengals, and never more than twice in a season. 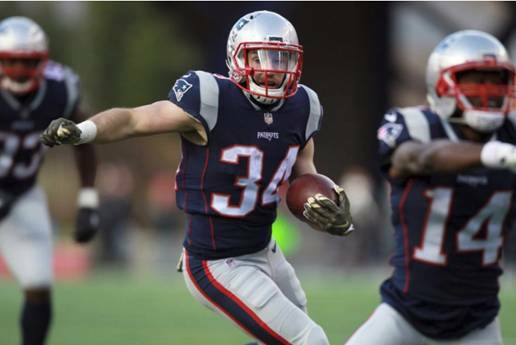 But despite missing a month worth of football this campaign due to a ribs injury – starting with Sept. 24 against the Houston Texans and ending with Oct. 15 against the New York Jets – Burkhead has crossed the plane for six on seven occasions. 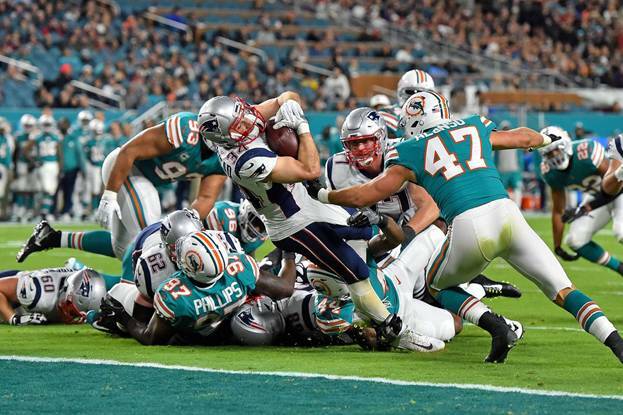 Burkhead posted consecutive multi-touchdown performances versus the Miami Dolphins and Buffalo Bills before getting there once more in the second quarter of Monday night’s 27-20 loss to Miami at Hard Rock Stadium. And with the three-yard plunge out of jumbo personnel, he now has four of New England’s 11 rushing touchdowns after having three in his Bengals career. He also has three of New England’s 27 receiving touchdowns after having one during his stay in Cincinnati. Drafted No. 190 overall in 2013, Burkhead handled the ball just 16 times through his first two seasons with the Bengals. And while he became an every-game active in both 2015 and 2016, it was special teams first on a depth chart reserved for Jeremy Hill and Giovani Bernard. In relative terms, it still is for Burkhead, who signed a one-year, $3.15 million contract with the Patriots on March 14. The 5-foot-10, 210-pound multipurpose back has played a higher percentage of snaps in the kicking game – 25 percent – than on offense – 19 percent – this year. In addition, he’s blocked a punt, returned a kickoff 17 yards and registered four tackles. So, the fact Burkhead is averaging a TD every dozen offensive touches says something. The fact he’s made five trips to the end zone in New England’s last three games certainly does, too. Burkhead has gathered 252 rushing yards on 60 carries. He’s tacked on a career-best 249 receiving yards on 29 catches. And, at least for now, he can say he’s right there with Gronkowski, who served his one-game suspension in defeat Monday. We’ll see whether one can take the lead outright next Sunday against the Pittsburgh Steelers at Heinz Field. Not long ago, though, it would’ve been hard to foresee Burkhead even having the chance to. ADA - East Central University Director of Athletics Dr. Jeff Williams has announced the hiring of Al Johnson as the 19th head coach for the Tiger football program history and just the fourth in the NCAA era, since 1997. "I am excited to present Al Johnson to Tiger Nation as our next head football coach," said Williams. "Al has been uniquely prepared for this opportunity and he made an immediate and unforgettable impression that never faded. I anticipate that will be the same for our players, campus, community and alumni. He brings an infectious passion for leading and developing student-athletes, which becomes evident to everyone he meets." "I am very excited and honored to be the next East Central University Head Football Coach," Johnson stated. "I want to thank ECU President Dr. Pierson, Director of Athletics Dr. Williams, and the entire search committee for this amazing opportunity." Tiger fans will have to wait until 2018 to meet the newest addition to the ECU Athletics staff, as Johnson still has to complete his current duties as the assistant offensive line coach at the University of Wisconsin. The Badgers will be competing in the Orange Bowl, Dec. 30 against Miami at 7 p.m.
"Al Johnson brings a unique mix of professional experience and different levels of coaching," ECU President Dr. Katricia Pierson commented. "He brings a great deal of enthusiasm and knowledge of football that will help lead the Tigers to success both on and off the field by believing his players should be equally committed to academics and athletics." Johnson has had a wide variety of experience as both a player and coach, working at NCAA Division I, NCAA Division III, in high school and operating his own camp. 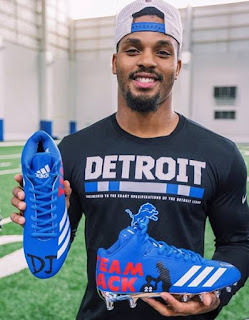 He has also seen great experience as a player on the field, playing for Wisconsin for four seasons and spending seven years as a member of the National Football League. He started his NFL career by being drafted by the Dallas Cowboys in the second round in 2003. The offensive lineman spent three season at center for the Cowboys and helped build them back to a playoff caliber team, making two playoff appearances. While in Dallas, Johnson met his wife, Brandy, and gained ties to Oklahoma through friends. 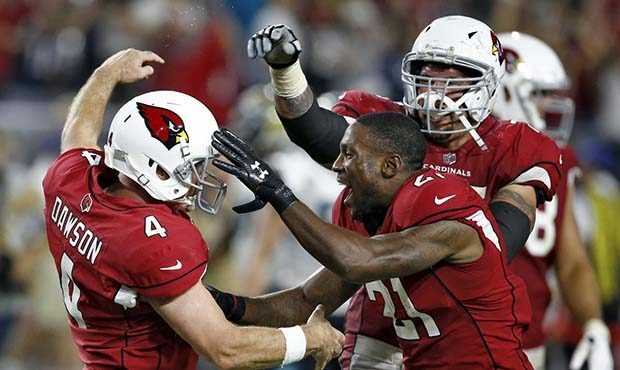 The pair decided right after having to move, when he was traded to the Arizona Cardinals in 2007, that they would love to return to the state to raise their family. "I want to make sure the ECU faculty and staff, alumni, fans and supporters know that I am committed to building ECU into one of the premier NCAA Division II programs in the country," added Johnson. "My family and I are looking forward to making Ada, Okla., our home and immersing ourselves into the community." Johnson spent the 2007 season with the Cardinals as a starting center before being injured in 2008. After recovering, he signed with the Miami Dolphins for the remainder of the 2008 season and made a playoff appearance. He ended his professional career in 2009 with the New England Patriots. Johnson earned his time in the NFL after being a standout at Wisconsin from 1998 to 2002. The three-time All-Big Ten selection was a Rimington Award finalist in 2000 and 2001, which is presented to the premier centers in the FCS, Division II, Division III, and NAIA division. The Badgers also earned two consecutive Rose Bowl championships (1999-00) during his tenure. After his time in the NFL, Johnson started his coaching career in 2013 as a co-owner and lead offensive coach of the Al Johnson Line Camp and as the offensive coordinator at Southern Door High School. The camp was designed to develop youth and high school linemen through mentoring and overall character building and served over 1,000 kids in three years. At Southern Door High School, he helped the team double their total offensive yards, coached five all-conference players and laid the foundation for three-straight conference championships. Johnson then moved on to the offensive coordinator and offensive line coach at St. Norbert College in De Pere, Wisc. In two seasons he helped the team to a 10-1 record, coached nine all-conference offensive players and the conference lineman of the year. Johnson then returned to his alma mater in 2016 as an assistant coach and helped to develop the offensive line into one of the best in the nation. In 2016 the Badgers claimed the Big Ten West and Cotton Bowl championships. He has coached three All-Big Ten selections and all-American and first round NFL pick Ryan Ramczyk. This season Wisconsin, ranked No. 6 in the nation, currently has a 12-1 overall record and finished with a 9-0 mark in the Big Ten, with the only loss coming in the Big Ten Football Championship Game. 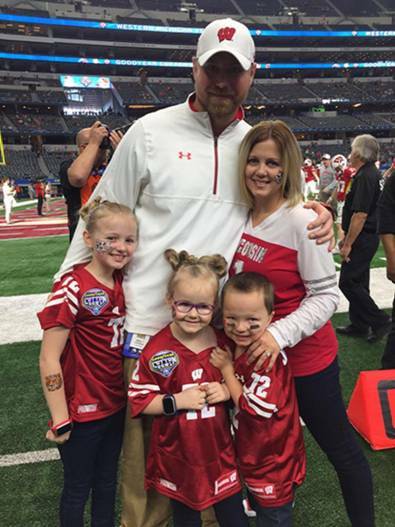 The Badgers will have one more chance to play in 2017, at they will participate in the 2017 Capital One Orange Bowl (Dec. 30), in Miami Gardens, Fla.
Johnson earned a bachelor's degree from Southern New Hampshire University in Sports Management in 2014 and is working on his master's degree at Wisconsin in Education and Leadership. Johnson married his wife Brandy while with the Cowboys and has four children; Skylar Burleson (18), Makayla (9), Cyrus (7), and Chloe (6). "I want to thank the members of the search committee who served our university diligently throughout the search process," Williams stated. "The rich heritage of ECU and Tiger Football made our position attractive to many highly qualified football coaches and provided an extremely talented pool of applicants. The process confirmed that Al Johnson was the complete package we were seeking in our next head football coach." Johnson will officially start Jan. 3, 2018 and the ECU Athletic Department will announce dates and times for meet and greet events at a later date. "I can't wait for the Tiger Family to meet Al, Brandy and their wonderful family as they join us in moving ECU toward future success," added Williams. 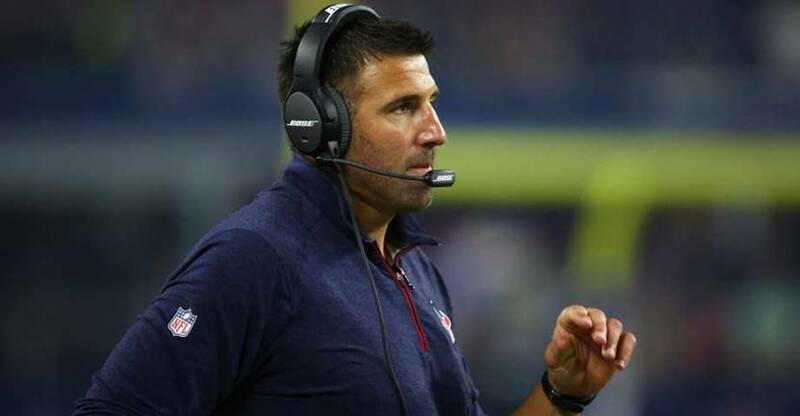 Texans defensive coordinator Mike Vrabel has grown accustomed to finding his name linked to head-coaching vacancies. 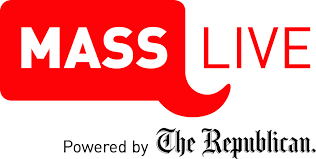 The former New England Patriots All-Pro outside linebacker is highly regarded in NFL circles. Vrabel was linked to the Los Angeles Rams' job that went to Sean McVay last year. He turned down the San Francsico 49ers' defensive coordinator opening two years ago before later being promoted from linebackers coach to running the Texans' defense. While Vrabel has plenty of ambition to be a head coach in the future, that's not his focus as he's trying to hold together the Texans' 20th-ranked defense that's playing without an injured J.J. Watt and Whitney Mercilus. "Obviously, I would entertain it, but right now we're clearly focused on San Francisco, like everybody here," Vrabel said. "I think that all those things that get taken care of in the offseason really are something that you can't concentrate on right now or anybody can. I think we have to play and we have to coach and we have to prepare and we have to practice. "I think when you get into coaching I think that everybody aspires to lead at the highest level, and clearly being a head coach in the National Football League is the opportunity to do that." Vrabel has ascended quickly in the coaching ranks. First, he was a position coach at Ohio State. Then, he coached the Texans linebackers. Now, he's in charge of an entire defense. "When I started coaching, I didn't think I would be in the NFL," Vrabel said. "When I started coaching I didn't think I'd be at Ohio State. Didn't think I would be coordinating. So, you never really know. You try to do as good a job as you can in the role that you have and then you go from there." Texans Pro Bowl pass rusher Jadeveon Clowney said he believes Vrabel is head-coaching material. "He's a smart guy," Clowney said. "He's the same guy every day. High-energy guy. He brings the best out of his players and he's a good coach." 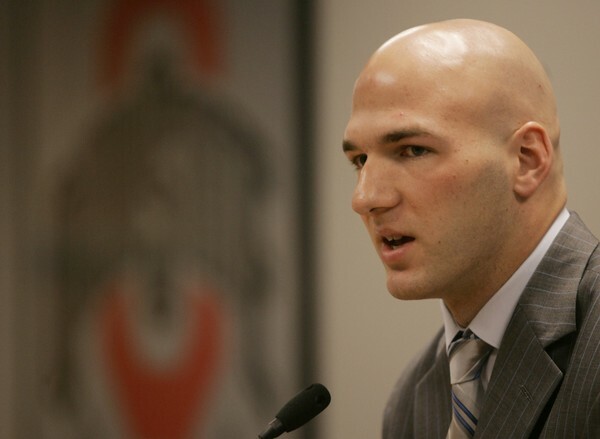 CLEVELAND, Ohio -- Anthony Gonzalez has landed an endorsement from Florida Sen. Marco Rubio in the race for Ohio's 16th Congressional District, in the latest sign that his candidacy is gaining support from the broader Republican establishment. Rubio's endorsement follows a phone conversation between the two about a month ago, according to aides. In a statement, Rubio said Gonzalez "is exactly the type of young, public-spirited conservative we need more of in Washington." In his own statement, Gonzalez, a former Ohio State University football star and ex-NFL player, said: "As a fellow Cuban American, I have been a long-time follower of Marco's career in the Senate and I have always appreciated his work to empower the middle class, strengthen our military and champion a pro-growth economy." Even though he is a first-time candidate, Gonzalez, 33, has taken a tried-and-tested approach to campaigning for the 16th District by seeking political endorsements and building a donor network. The seat currently is represented by Republican U.S. Rep. Jim Renacci, who is running for governor instead of re-election. Gonzalez has gotten support major donors within the 16th District, including the influential Timken family, and from U.S. Rep. Bob Gibbs, whose district is directly west of the 16th. Last month, the National Republican Congressional Committee, the political arm of U.S. House Republicans, recognized Gonzalez for his fundraising and campaigning efforts. Gonzalez's approach contrasts with that of major Republican candidate for the 16th District, 28-year-old Stark County State Rep. Christina Hagan. Hagan's campaign has modeled itself after the insurgent approach President Donald Trump took in his successful run for the White House last year, focusing on building a social media presence, making media appearances, emphasizing socially conservative and nationalist positions, and soliciting support from pro-Trump figures. On Monday, the Hagan campaign announced she will hold a "campaign rally"/ fundraiser in Stark County on Dec. 15 in Louisville. The event will feature two pro-Trump figures who have endorsed her -- Sebastian Gorka, the former Trump national security aide and the Rev. Darrell Scott, a Cleveland Heights pastor who is close with Trump and his allies. It also promises a "surprise special guest." The eventwill be hosted by members of the Sarchione family, who own auto dealerships in the area, and requires a $100 minimum donation. Rubio's endorsement of Gonzalez is among the first of a string of national U.S. House endorsements that Rubio plans to make, an aide said. Rubio, who lost the presidential nomination to Trump last year, also has endorsed Republican Ohio Treasurer Josh Mandel in his run for the U.S. Senate. Mandel endorsed Rubio in the primary last year. Other candidates for the 16th District seat include Republican Kit Seryak, an Army veteran and Democrats Jennifer Herold, an occupational therapist from Strongsville and Aaron Godfrey, a physicist from North Olmsted. There’s a common misperception about Patriots coach Bill Belichick that when reporters ask him a question, he just grumbles non-answers. That’s not the case. Yes, that’s the case if Belichick dislikes a question. If it’s about a player’s injury, forget it. If it’s a question that answering might give an opposing team some insight into the Patriots’ game plan, Belichick is tight-lipped. If it’s clearly designed to produce a sound bite, Belichick will give an answer that demonstrates his disdain for sound bites. But if Belichick gets asked an Xs and Os football question from a reporter who seems genuinely interested in learning, then you’d better sit back and get comfortable, because Professor Belichick’s Football 101 lecture is about to begin. That happened on Friday, when a reporter asked about the loss of Nate Ebner, who suffered a season-ending injury last week. Ebner acted as the protector on the Patriots’ punt team, and the reporter wanted to know how hard it would be to replace him. Belichick proceeded to give an answer that, according to the team’s official transcript, lasted nearly 700 words. 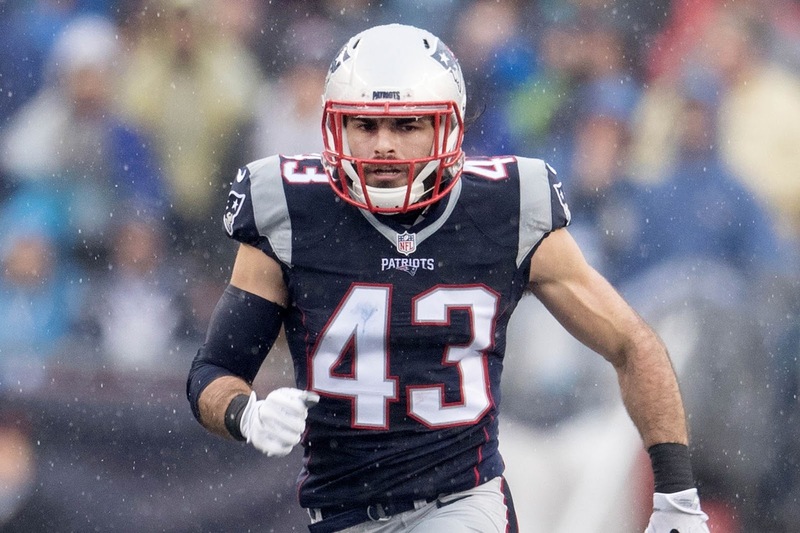 FOXBOROUGH -- Marquis Flowers had spent three seasons with Rex Burkhead in Cincinnati, running with him on all special teams units, chasing after him when the Bengals second-string offense earned practice reps.
Few men in the NFL -- players, coaches, or front office staffers -- were in a better position to offer an evaluation of Burkhead heading into free agency this past spring. And here was Flowers' evaluation. "Don't let this guy get in the hands of a team like New England," Flowers remembers thinking. "I was back there (in Cincinnati) saying it. This dude get into the hands of New England, that's the only team that I thought -- that I knew -- it was going to be trouble." "So when he went there, the league didn't know yet, but we knew," Flowers said. "I think everyone in Cincinnati knew what was going to happen this year." Burkhead isn't a Pro Bowler, and he isn't even technically a starter. But he is one of the more unique players to swing by Foxborough in quite some time. He burst out of a three-point stance on a punt versus Denver, maintained his balance as rookie safety Jamal Carter jabbed the side of his helmet, accelerated past personal protector Justin Simmons, and practically blocked Riley Dixon's punt with his chest. In the same game, while isolated out wide against Denver safety Darian Stewart, Burkhead made an immediate cut to gain inside leverage, pushed his route up upfield, then broke into a slant for an easy 14-yard touchdown from Tom Brady. He shook free of Chargers safety Adrian Phillips on a deliberate -- but effective -- spin move, picking up 14 yards on one of his seven receptions in Week 8. He plunged forward for a short-yardage touchdown against the Dolphins, and on another goal line opportunity motioned out of the backfield and made quick work of heavy-footed Miami linebacker Chase Allen for a 1-yard touchdown catch. Burkhead has caught 21 of 26 targets, matched his touchdown total (4) from his first four seasons in the NFL, blocked for Dion Lewis on the kick return unit, and carved out roles in short-yardage and third-down situations. "You know how they say jack of all trades, master of none?" said former NFL running back Roy Helu, who played alongside Burkhead at Nebraska. "Honestly, he's mastered certain skills and he can do it all." There are two obvious question: How did Burkhead accumulate all these unrelated skills? And why now? Why does he come to the Patriots and excel when he hardly saw the field for the Bengals? Burkhead doesn't have any earth-shattering answers for the first question. Like most NFL players, he was a star player growing up. He'd only see action on the special teams units if asked to return a punt or kickoff. Not until he arrived in Cincinnati did he put his hand in the dirt and charge a punt, or stand on the front line of the kickoff return team. Burkhead, a sixth-round pick in 2013, said the Bengals coaches were upfront with him: "To find a position on this team," they told him, "you're going to find a role in the special teams phase." "Him on special teams, it was a problem," said Flowers, who was reunited with Burkhead in a late August trade to the Pats. "Everyone has to work on stuff, but he was one of those guys who could just run down guys and tackle, definitely a good tackler." Burkhead's natural receiving ability was already developed by the time the Bengals drafted him 190th overall in 2013. Those skills, he said, were refined in his hometown of Plano, Texas, one of America's most famous football cities. While he also played basketball and baseball growing up, Burkhead frequently competed in 7-on-7s during the football offseason. "You can't run the ball then," Burkhead said, "so it was mostly pass-catching." Burkhead's father, Rick, was his coach in pee-wee football. Decades earlier, Rick Burkhead had been a fullback at Eastern Kentucky and, briefly, he competed for jobs in training camp with the 1992 Dolphins and 1993 Eagles. He stressed the importance of becoming an all-purpose back. Burkhead's older brother, Ryan, was a standout defensive end at Plano Senior high school. At 6-foot-3, 250 pounds, Ryan went on to play college ball at Harvard. "He got the size, height, the brains, he still has his hair, it's just like 'man...'" joked Rex, 5-foot-10 and balding. Ryan's presence helped Burkhead develop his physicality, a rare trait among pass-catching running backs and one of the unique aspects of his game. After all, how many third-down specialists also play the role of goal line back? Burkhead's footwork, his uncommon polish in the passing game, is the product of two factors, according to Helu. He describes it like this: Once, when the team was arriving for 6 a.m. conditioning, Nebraska tight end Niles Paul declared to Helu, "Dude, you need to start taking football seriously!" "Look at this guy!," Paul said, referring to Burkhead. Unbeknownst to Helu, Burkhead had shown up at 5 a.m. for an hour of jump rope before official conditioning commenced. This was Burkhead's sophomore year. As a freshman, he caught Helu's eye immediately when the Huskers broke into receiver drills. "You either have it or you don't," Helu said, "and when you don't have it you do your best to try to become moderate at tracking a ball and catch it at different angles. But with Rex, he had it." Watching Burkhead run routes that first day of spring practice, Helu thought, "Who is this white kid who just got on the team?" "He was really skilled and really agile at the time," Helu recalled, "and what you see (now) is what you've always had." So here's the more complicated question: What happened in Cincinnati? Prior to Weeks 16 and 17 a season ago, Burkhead had never carried the ball more than nine times in a NFL game. Prior to Week 13, he had never carried more than five times. He was decidedly a non-factor for the Bengals offense, destined to leave in free agency when his rookie deal expired. "Listen, this is the NFL and sometimes it happens that way," explained Flowers. "There's no reason why he shouldn't have been playing." Helu, who spent five seasons in the league with the Redskins and Raiders, often wondered about Burkhead's status in Cincinnati. While with Oakland in 2015, he asked a teammate who previously had played for the Bengals, "What's going on with Rex?" "The guy straight outright told me, and I'm paraphrasing here, 'You know how coaches are, they have their favorites,'" Helu recalled. Not until Gio Bernard tore his ACL and Jeremy Hill suffered a late-season knee injury did Burkhead see an extended opportunity. In the final two games of the season, he racked up 45 touches for 211 yards, flashing power and balance between the tackles and impressive precision as a receiver. "There was enough for us to go on," Belichick said, "enough to evaluate." 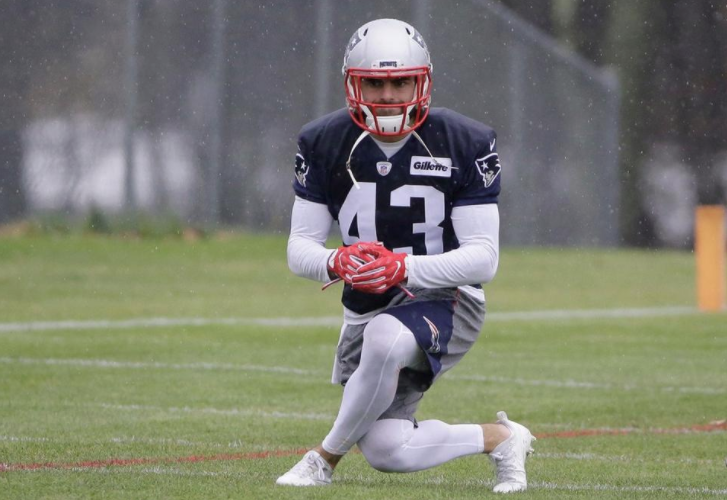 In the spring, after Burkhead had inked a one-year deal with the Pats, Bengals coach Marvin Lewis predicted a bright future for the running back. Perhaps as a preemptive attempt to assuage concerns that the Bengals had erred in letting him go, Lewis pointed toward Burkhead's injury history. "Even in preseason opportunities and so forth where he'd go into the games and it would be Rex's ballgame to carry the ball in the first and second quarter and he wasn't able to suit up," Lewis told The Globe. "That's one of the things he's battled over the years is being 100 percent completely healthy." He's not wrong. Burkhead logged only 15 preseason carries from 2014-16. His strong finish to the 2016 season boosted his stock in free agency, and the Bengals seemed intent on tapping into a loaded running backs class in the draft (they drafted Joe Mixon in the second round). So they let Burkhead walk. While Burkhead's success in New England was almost too predictable, it's not the result of a truly egregious personnel decision by Cincinnati. What qualifies as egregious: The Browns kept three lumbering running backs -- Ben Tate, Isaiah Crowell, and Terrance West -- over Dion Lewis in 2014 (Everything he's doing now, he was doing in Cleveland," West said in 2015. "Same exact stuff.") A year ago, the Lions traded Kyle Van Noy, who was starting at the time, and a seventh-round pick to New England for a sixth-round pick. It made little sense at the time, and makes even less today. The Burkhead acquisition is not in the same category, but it still is widely viewed as a steal for New England. "It happens all the time," Helu said. "Remember, there are a lot of guys that are good enough that are on the bench right now." Somehow, the Patriots keep finding them.